We can think of many words to describe chilaquiles. “Sophisticated” is not necessarily one of them. 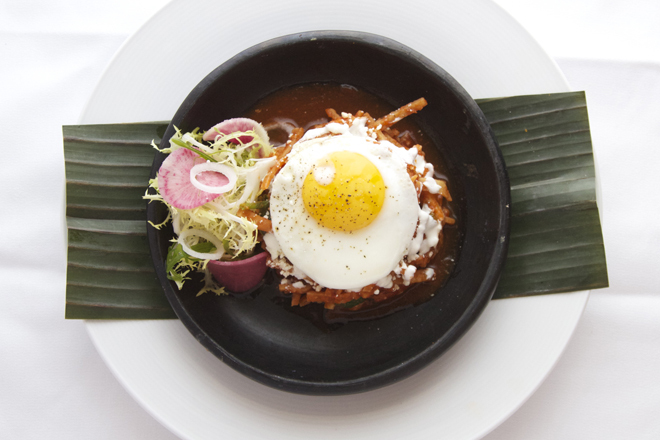 But when we saw what Julio DeLeon, a cook at Topolobampo, is doing with chilaquiles on the new lunch menu (that’s his dish pictured above), “sophisticated” is exactly the word that came to mind. There’s nothing rustic, nothing “artfully messy,” about these chilaquiles. No, these are chilaquiles you can serve at a dinner party. That got us thinking—could we serve this at a dinner party? Really? Yes, really. Let’s get started. The sauce is simple enough. In a large (10-inch) pan (we use cast-iron lined with tin foil), dry-roast 3 unpeeled garlic cloves, half of a large onion sliced 1/2-inch thick and 1 or 2 habanero chiles. Get them nicely charred, like you see above. (This will take about 7 minutes.) Let cool. 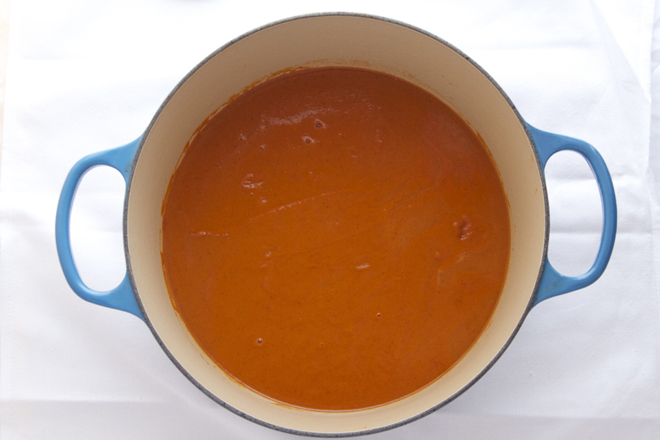 In a medium-large Dutch oven, heat 2 tablespoons vegetable oil over medium heat. When the vegetables have cooled slightly, chop the onion, add it to the pot and cook, stirring, until it’s golden brown (3 or 4 minutes). Chop the garlic, add it to the pot and cook for another minute. Chop the chile and add it to the pot along with 2 15-ounce cans diced fire-roasted tomatoes and 2 sprigs of epazote. Let all of that simmer, uncovered, for 10 minutes, then blend it until smooth and season with salt (usually 1 teaspoon). Now comes the fun part. 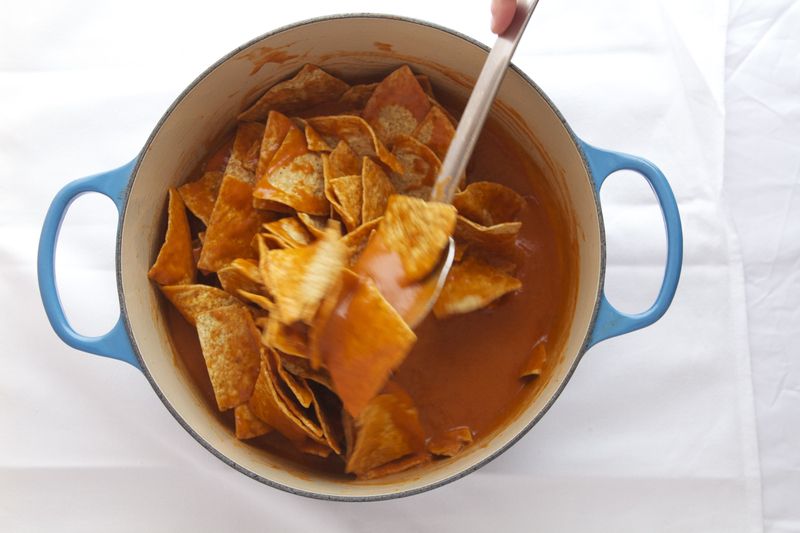 Return the sauce to the pot, place over medium heat and pour in 10 ounces of tortilla chips. You want thick chips here—thin chips will get mushy. Cover the pot and let the chips soften in the sauce for 3 minutes. Now you’re ready to plate. 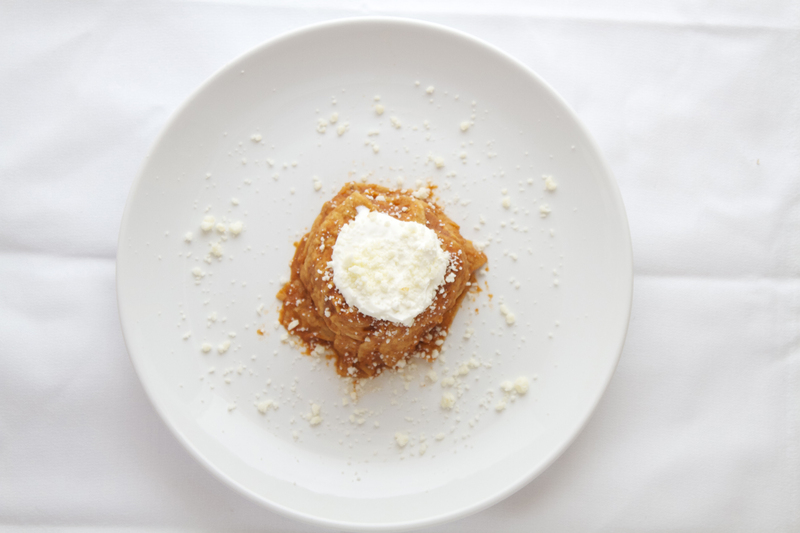 The guys at Topolo use ring molds for their chilaquiles, and this, essentially, is what gives them that white-tablecloth-ready look. Ring molds aren’t expensive (unless you buy them at Williams-Sonoma) but you probably don’t have them in your house. We don’t even keep them here in the test kitchen. So we came up with a hack: Ramekins. Don’t worry, it gets prettier. Top each mound of chilaquiles with 1 tablespoon crema and sprinkle the whole plate with 1 tablespoon queso fresco. You could eat it just like this if you want to, maybe with a sprinkling of chopped cilantro. 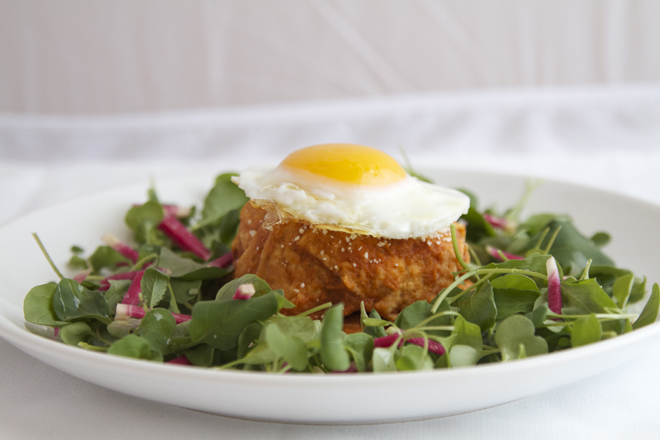 But to make it more Topololike, we added a little salad and topped the chilaquiles with a fried egg. Heat a large (10-inch) (non-stick or lined with foil) skillet over medium-high. Lay in the garlic, onion and chiles and cook, turning occasionally, until they’re softened and darkened in spots, about 7 minutes. Let cool. Heat 2 tablespoons of the oil in a medium-large (4- to 6-quart) heavy pot (preferably a Dutch oven) set over medium. When the vegetables are cool enough to handle, give the onion a rough chop and scoop it into the pot. Cook, stirring, until golden brown, 3 to 4 minutes. Chop the garlic, add it to the pot and cook until aromatic, about 1 minute more. Stem and chop the chile and add it to the pot along with the tomatoes and epazote. Bring the mixture to a boil, then reduce the heat and let it simmer, uncovered, for 10 minutes. Transfer the sauce to a loosely-covered blender jar and process until smooth. Taste and season with salt, usually about 1 teaspoon. Return the sauce to the pot, set over medium heat and bring back to a simmer. 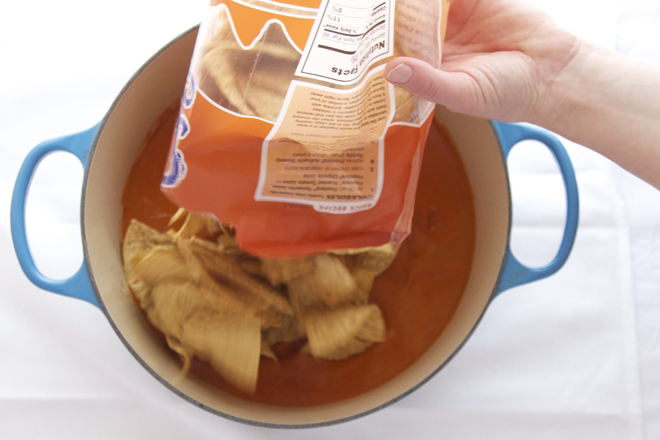 Pour the tortilla chips into the sauce and fold them into the sauce with a spatula until coated. Cover the pot and let the chips soften in the sauce for 3 minutes. Remove the pot from the heat. Line 4 6-ounce ramekins with plastic wrap, leaving about 4 inches of overhang on either side. Use a slotted spoon to transfer the chilaquiles to the ramekins, filling each ramekin to the rim and packing the chips in lightly with the back of a spoon. To serve the chilaquiles, place a plate over each ramekin, grasp the plate and ramekin firmly, then reverse the two. 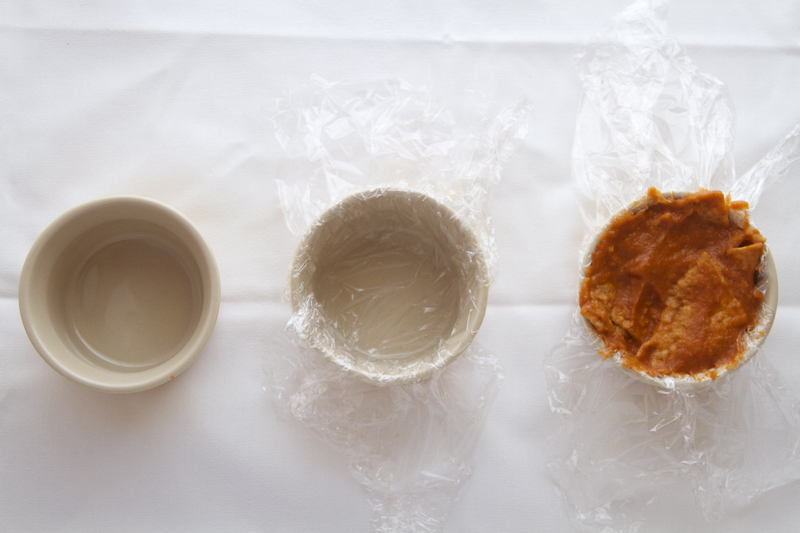 Gently lift off the ramekin and remove the plastic wrap. Top each mound of chilaquiles with 1 tablespoon of crema and sprinkle with 1 tablespoon of queso fresco. 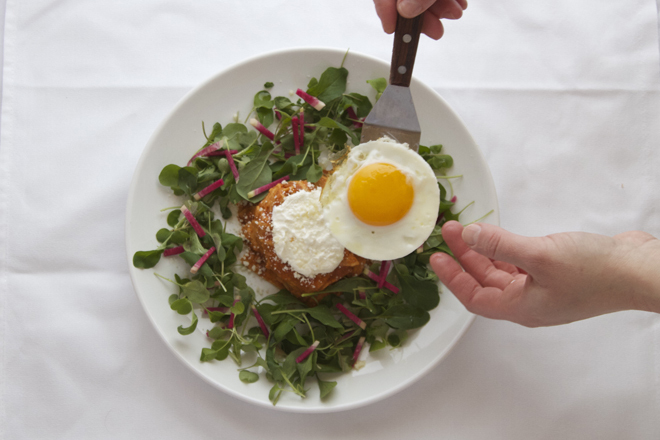 If you like, crown the chilaquiles with a fried egg. Arrange the greens around the chilaquiles, sprinkle the radishes over the greens and drizzle the salad with the remaining tablespoon of oil. Finish the plate with a sprinkling of salt and you’re ready to serve. Cant wait to make them, thanks Chef! Can fried pork be used in place of shredded chicken? i have been making chiliquiles for many years….sorry, we love ours very much. in our home made sauce….layering with fresh chopped onions and cheeses. 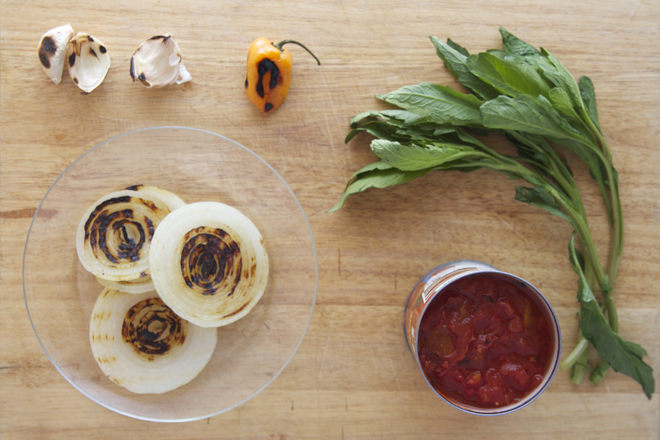 Each tortilla is fried in evoo til crisp…then the transformation begins. Sounds like something I would love since chilaquiles is comfort food for me! Thanks a bunch! I will try them this week. We used to have Chilaquiles a lot during lent. Now I make them for my grandsons and great grandson. Will have to try using the chips. My husband always have them with “un huevo estrellado” on top. Thank you for the great recipes and your web page. No ring molds or don’t want to buy them? Use tuna cans or even green chili cans. This genius. Thanks for inspiring so many good recipes. Several brilliant ideas rolled into one …. have had them, and yes, delicious…..with homemade tomatillo sauce that is.. Whenever I make the more rustic version of “chilaquiles for a crowd” from One Plate at a Time they are a hit. 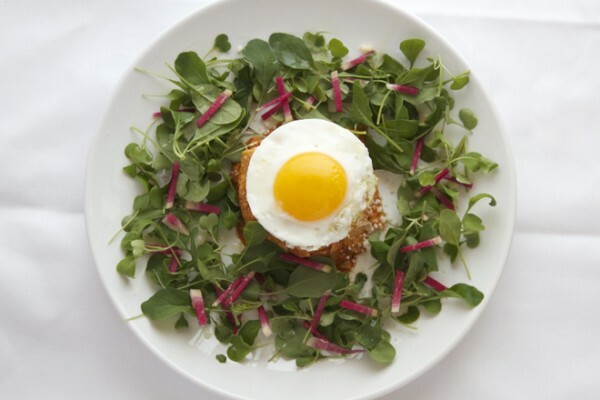 I cannot wait to serve the sophisticated version incorporating the salad and egg with presentation. Holy crap ! 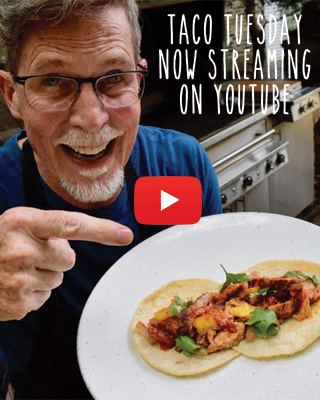 I never thought you would have a Test Kitchen ! I thought you created and played with recipes in the Back of House ! Love this presentation and recipe ! I can’t wait to try it ! Perfect for my Mother-In-Law ! Thank you SO much for another inspiring recipe – I have never had them and I am on the Mexican border at McAllen & Reynosa !!!! No doubt they should taste good. Not good looking unless you put an egg on top. Probably too wet, less time in the sauce so tortilla chips show their shape once served. Would like to try them some day. Egg very well done. I would like to know , how to make small bowls out of masa, to stuff with whatever. I have an idea but want to make sure, they would need to be baked or cooked in oil.